Rebuilding a mouthful of teeth with dentures can be an intimidating process – thankfully, our team at Atrium Family Dental is always here to address your questions and concerns. Please take a look at some of the most common FAQs we receive below to learn more. If you can’t find the information you want, you can contact us directly here in New Lenox, IL for further insight about this reliable reconstructive service. Yes. You can get dentures that will replace all of your teeth or just some of them. The ones that replace all of your teeth are “complete” dentures. Dentures that replace only some of your teeth are “partial” dentures. This is one of the most common questions we receive, and its origin goes way back. You probably heard horror stories from your grandparents about embarrassing moments caused by slipping dentures. The fact is, though, that today’s dentures fit very well. The chances of experiencing any slipping and sliding is slim to none. It pretty much depends on what you expect. Dentures are not generally expensive, but the more you want, the more you will pay. If you want a set of dentures that looks good and works well, chances are you won’t be all that much out of pocket. However, if you want a set of dentures that look exactly like your natural teeth, you might end up paying a bit more. 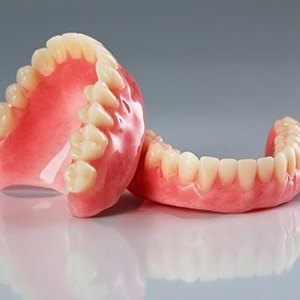 Are Dentures Hard to Care For? Not in the least! In fact, if you make sure not to drop them and you clean them regularly, you can expect your dentures to last you for a very long time. Can I Use Toothpaste on My Dentures? It’s not a good idea. Toothpaste is generally meant to be used on natural teeth and could harm your dentures. You should use a cleanser that is specially formulated for your dentures. Well, that’s about it. If you have any other questions about dentures, you can feel free to get in touch with Atrium Family Dental in New Lenox, IL. Dentures do not have to be scary, so be sure to call us with your questions.